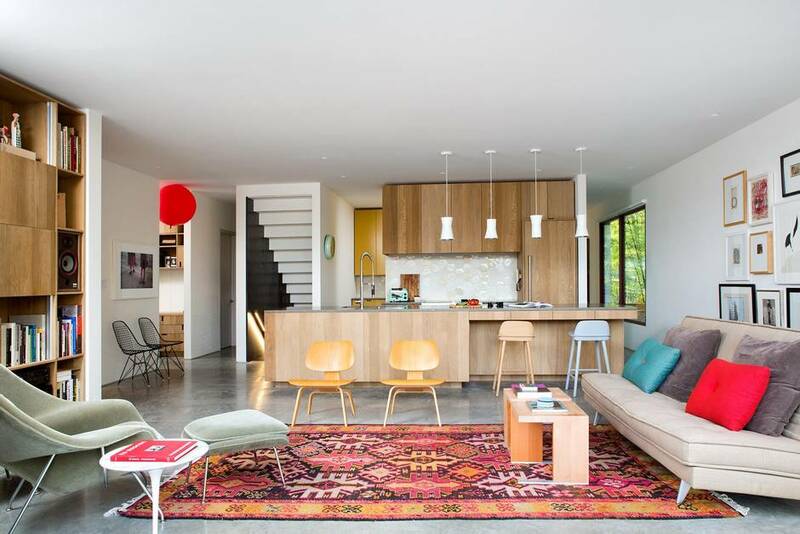 The house stands out unmistakably on a placid street of Vancouver’s Upper Kitsilano, otherwise lined with replica Tudors, historic Arts and Crafts, non-descript 1970s bungalows and 80s mini-mansions. Cypress boards that have been charred to a deep matte black cover the front of this tall box, framing floor-to-ceiling windows on two levels. The rest of the box is concrete, but variations of it, in places smooth, in others rough and filled with small pebbles. Rough House, pictured from the rear. Architects Clint Cuddington and Piers Cunnington don’t see this house as a luxury one-off. It’s a tribute to those materials that inspired architect Clint Cuddington to call this building – his family home, his experimental project for his company, and now the winner of a B.C. Lieutenant-Governor’s award for architecture – Rough House. But he and his business partner at Measured Architecture, Piers Cunnington, don’t see this house as a luxury one-off. “We hope to be catalytic,” says Mr. Cuddington, whose company won two other architecture awards this year on other projects. 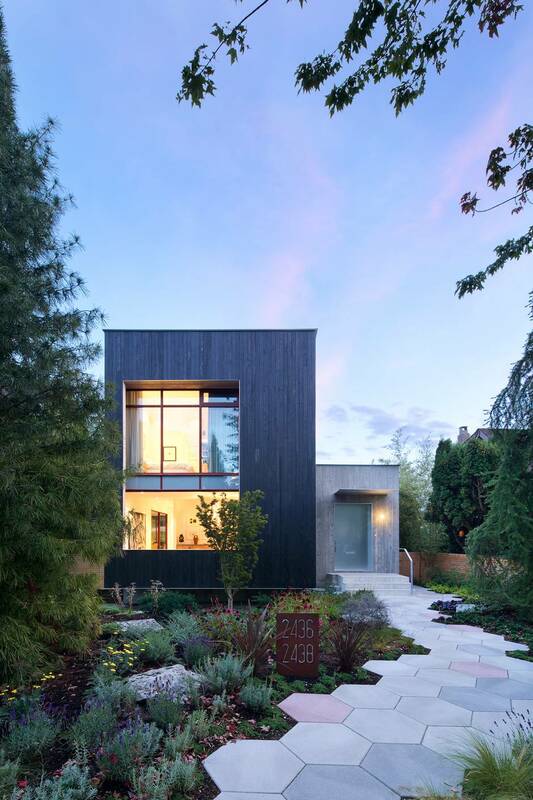 One was a house in Shaughnessy that had its 1910 heritage exterior restored impeccably, while the interior of the house was turned into a temple to the sleek and modern. The AIBC jury gave it a special award for coming up with a solution to a bitter fight in Vancouver: preserving the city’s older homes when inhabitants want to live in something contemporary. 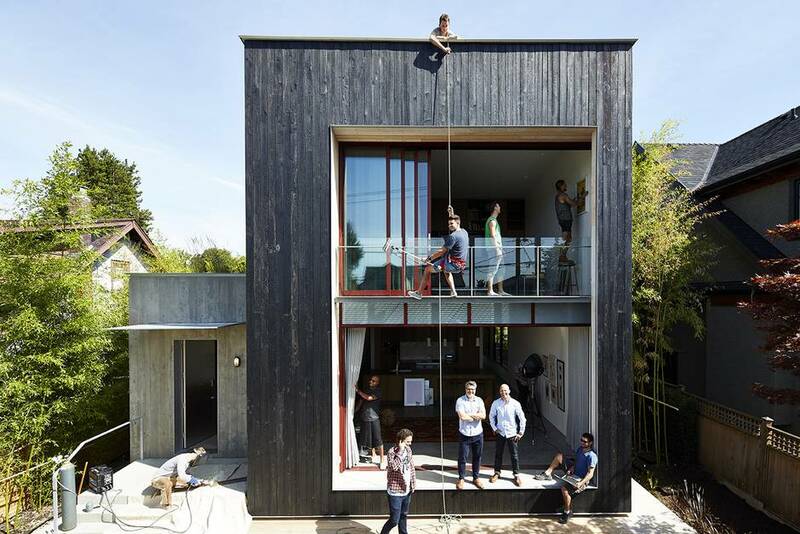 The other, a Vancouver Urban Design Award winner, was – like Rough House – a new house with a laneway in the back, built in Point Grey. The two architects aren’t planning to have hundreds of residents buying exact knock-offs of their houses any time soon. But they do hope they inspire buyers and builders to think differently and focus more on what makes a home work for the people who live in it. The back yard is a comfortable extra living space. Right now, they say, so many builders and buyers are focused on houses as investments and afraid to do anything unconventional because they’re worried it will hurt the resale value. That mentality has led to some bland new houses and an unwillingness to experiment. “We’re trying to get over the paralysis,” says Mr. Cuddington, as he and Mr. Cunnington sit out in the unusually warm Vancouver spring sunshine one afternoon on the back deck of Rough House. The floor-to-ceiling sliding doors at the back have been fully opened, and the house’s joint kitchen and family room, with a long work counter that faces the outdoors, seems to extend seamlessly into a raised deck of silvery-gray boards. Beyond the deck is a patio, and beyond that a living wall of plants belonging to the small laneway house at the rear of the lot. 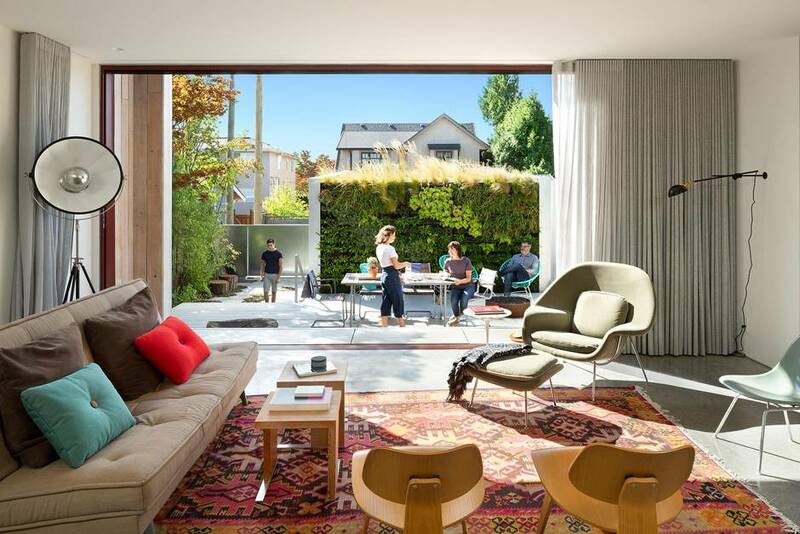 With the green backdrop, the back yard is transformed into a comfortable extra living space, rather than the dark well that is becoming the standard in a Vancouver with so many properties that have added laneway houses. “We hope we are creating good examples, doing in our modest way as much as we can to show that you can develop something unique and at a price point that is reasonable,” Mr. Cunnington says. Vancouver’s connoisseurs of single-family homes say these kinds of innovations, done for a few custom clients here and there over the decades, have been the inspiration for changes to the type of housing in the city. The house, nestled in Vancouver’s Upper Kitsilano, is one firm’s answer to what some consider Vancouver’s uninspired housing diversity. They say that often the city’s rules about what can be built on single-family lots have encouraged production companies to do nothing more than look at how they can maximize the square footage. “If you look at south of Shaughnessey between Oak and Cambie, there’s block after block of not very interesting brochure-cover houses,” says Ron Kellett, a University of B.C. landscape architecture professor who has researched Vancouver’s housing typologies. The city has developed interesting housing forms in the past, says Mr. Kellett, because the lot sizes were taken from English tradition. The 33-foot-wide Vancouver lot is the standard “two rods” of the past. The city’s better houses adapted well to that property form. Former city councillor Gordon Price, another keen observer of Vancouver housing, also bemoaned the fact that the city’s zoning bylaws often encourage a generic response. The decision to give bonuses for houses built in a quasi-historic style has compounded that; in their desire to get the maximum space, builders have opted for safe, faux-historical looks. The architects hope the house will be new model for how to combine the public and private spaces every family needs. But, Mr. Price says, the small, creative builders who build for the approximately 10 per cent of buyers willing to try something new often have an impact. New, modernist houses in Los Angeles were the inspiration for the split-level suburban houses mass-produced later. In Vancouver, architects like Ron Thom and Arthur Erickson emphasized houses where the outdoor and indoor blended and that has now been incorporated into many non-architect-designed houses in the city. The two Rough House architects hope this is what they will inspire, especially as more Vancouver houses every year add laneway homes. They also hope Rough House and its laneway will be a new model for how to combine the public and private spaces every family needs. The laneway home has no windows facing the main house. Instead, the glass doors open to the side. That affords occupants of the two houses more private territory. The main house has also been designed to alternate between big, open spaces where people can gather and talk, like the large kitchen and family room at the back of the main floor or the multi-purpose library, entertainment and living room at the back of the second floor. But the master bedroom and its opulent bathroom are cached in the basement, which has been designed so light spills in through high windows on the east, offering a place to be away from everything. So is the dining room on the main floor, a small, enclosed-feeling room at the front of the house, separated from the open kitchen. From every room, there’s a view that helps connect to the outdoors. The laneway house has a roof garden that is mainly visible from the second floor of the main residence, providing a green space to look out on. It gets another green lookout with a roof garden on top of a low section next to the main staircase. As for how Rough House is being received by average residents – not just the award-giving bodies – Mr. Cuddington says many visitors are entranced by it. But his neighbours are still warming up.